Hello – sorry for the blog silence yesterday but I spent all day in bed sleeping off whatever was wrong with me . Thank you to everyone who left me such lovely comments, I am shockingly behind on catching up with other peoples blog but I promise I will try and get back to everyone over the next few days. 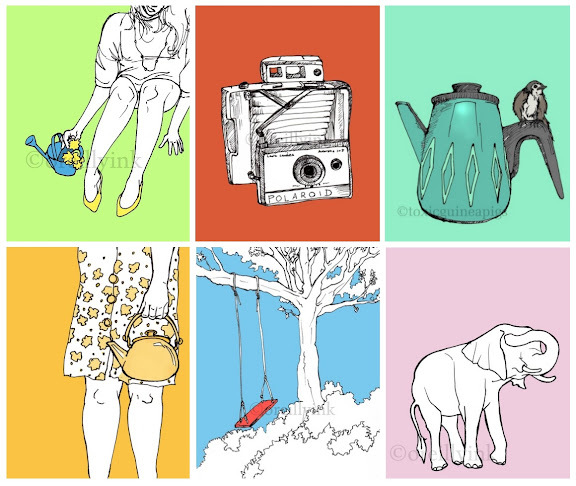 The last 6 months of 2009 were extremely exciting for me and my blog and a lot of the giveaways and exciting adventures wouldn’t have been possible without some amazing etsy shops and supportive blogger friends! So here’s a shout out to the amazing etsy ladies who were so supportive last year – I can’t wait for more etsy love in 2010. Yeay! It feels like such a long time ago that Megan was my first big giveaway for 50 followers but I’m so glad that we found each other! As well as a mutual love for vintage cameras and photography Megan was also amazing enough to feature my photos and shop on her blog last year – something I still can’t quite believe considering the other amazing etsy shops she has featured before and since! Here are a couple of my favourite prints from her shop, I’m lucky enough to have one the first Time Travellers print (It’s so amazing in person) but the next one is definitely on my etsy treats list! Jana was incredibly generous to offer some of her jewelry for my 100 followers giveaway but it is her paintings that I have completely fallen in love with, especially her latest Mandori apples series. in her shop - you won’t regret it! Eep, don't tell anyone but I am a little bit envious of the winner of my 150 follower giveaway from O’Reilly Ink as I am still completely smitten with Maggy's beautiful prints. I will admit that I love love love Cassia's photography, especially her Lola's Room photography so I was incredibly excited when Cassia agreed to be part of my 200th follower giveaway! I love the colours, the tone, the cameras, the shoes, everything!! I'm so excited that Cassia is having a January sale at both of her shops (Both Cassia Beck Photography and Lola's Room Photography) as it gave me the perfect excuse to buy some of her gorgeous prints - I can not wait to hang them in our house! Once again I would like to say a massive thank you to all the ladies above.